Greta Van Fleet, will kick off its 2018 tour schedule at the Coachella Valley Music and Arts Festival on Friday, April 13, 2018. The band's itinerary will include a slew of other major outdoor music festivals as well as headline dates that will see them playing to larger-capacity venues and multiple nights in some cities. With many more dates to be confirmed, Greta Van Fleet's initial 2018 tour itinerary can be found below! 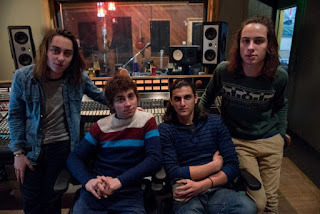 Prior to the tour, the Frankenmuth, MI-based Greta Van Fleet - 21-year old vocalist Josh Kiszka, brothers Jake (guitar, also 21) and Sam (bass, keys, 18), and longtime family friend Danny Wagner (drums, also 18) - are spending January and February recording its debut full-length album anticipated to be released late Spring/early Summer (Lava/Republic Records). The album will be recorded in Nashville and Detroit and produced by Al Sutton and Marlon Young, the duo that helmed the band's critically-acclaimed, chart-topping/breakout EP Black Smoke Rising (4/21/17) and the follow up From The Fires double EP (11/10/17). For the album, the band has an archive of songs written over the past few years as well as brand new material penned late last year when they spent a week in the Tennessee woods. So, fans can look forward to the next evolution of, as Revolver magazine put it, Greta Van Fleet's "high-octane, soul-and R&B-influenced riff rock." "Each of us has his own set of influences so that brings a great diversity to the music we make," said Jake. "Every one of our songs has its own unique complexities and we'd like for the full album to showcase that diversity, let people see what we can really do."